Solution of the D7 version 94 of Reshebnik on theoretical mechanics Targ SM 1983 - termehu. The mechanical system consists of the pulleys 1 and 2, wrapped yarns 3-5 and loads attached to these strands (Fig D7.0 -. D7.9, Table D7.). 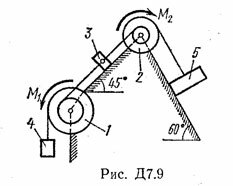 The system moves in a vertical plane under the action of gravity forces and forces of two pairs M1 torque applied to the pulley 1 and the pair M2 torque applied to the pulley 2. The radii of the pulley 1 are stages: R1 = 0,3 m, r1 - 0 15 m, and the pulley 2 - R2 = 0,2 m, r2 = 0,1 m; their inertia with respect to the rotation axis are, respectively, the radii ρ1 = 0,2 m and ρ2 = 0,1 m.
Neglecting friction, determine the acceleration of the load, having a greater weight; weights P1, ..., P6 pulleys and loads given in the table in Newtons and moments - a nyutonmetrah. One of 3,4,5 cargo whose weight is equal to zero, the figure does not portray; pulleys 1, 2 are always part of the system. After payment you will receive a unique reference to a quality solution of D7 Option 94 on the theoretical mechanics of a single SM Reshebnik Targ 1983. I would be very grateful, if after downloading works you leave a positive review. This will help to make the service better.